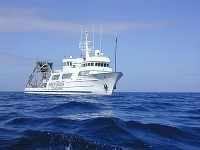 For the second year running I was fortunate enough to have taken part in a US based deep-sea research cruise. My role this year, as it was last year, was as an educator writing web based mission dispatches aboard the R/V Seward Johnson (go to www.at-sea.org/missions/maineevent4/feature.html). We were working 250 km of the New England coast, surveying the gelatinous life in the deep canyons on the outer edge of the Gulf of Maine. The main research tool was the submersible Johnson-Sea-Link II (JSL). In my role as an educator I was keen to develop ways in which we could actively involve Australian students in oceanic research and exploration. My first steps in this direction concerned a collection of foam cups that students in Victoria and Tasmania had decorated. While at sea, I took the cups to almost 1 km below the waves and into Oceanographer Canyon to demonstrate the effects of pressure at this depth. Simple idea - fabulous results. The cups were on the outside of JSL and, thankfully, I was inside one of the two pressure chambers. I was happily sitting there at 1 atmosphere (pressure = 1 kg/sq cm) and the cups were having the air squeezed out of them and crushed by close to 100 atmospheres (pressure = 100 kg/sq cm). Details can be found at Dispatch 6. This year's trip highlights were many - a dice with Hurricane Isabel, a 5 meter Greenland shark bumping into JSL at 900 meters (the video of this event was removed from Dispatch 14 because viewing requests overloaded the HBOI web server), a wonderful collection of bioluminescent organisms (including a deep-sea octopus that has replaced its suckers with glow in the dark organs) and the usual, he says casually, collection of new and undescribed sea jellies and comb jellies. One of the really great aspects of this year's cruise was the presence of six young scientists on board. Three were post graduate PhD students, two were undergraduate students and the final one was a research assistant. Apart from bringing a great deal of fun and youthful enthusiasm on board, Anio, Brian, Whit, Brennan, Nicole and Helen showed me just how much an experience such as this can shape a young life. His mission dispatches for the 2002 expedition can be found at www.at-sea.org/missions/maineevent3/preview.html. The Maine Event section of the at-sea web site provides full details of the expedition, technology used and has videos and animations. The official Ghosts of the Abyss web site provides details of a range of aspects of the 3D adventure, including video clips and a simulated ride in a Mir submersible. For teachers a number of activities are presented as downloadable pdf's in the education section. 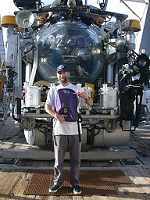 As an added adventure, one associated with students using LEGO MindStorms to build a ROV (Remotely Operated Vehicle) and camera system, go to the Team Titanic site at Tufts University in the US at http://www.ceeo.tufts.edu/robolabatceeo/.